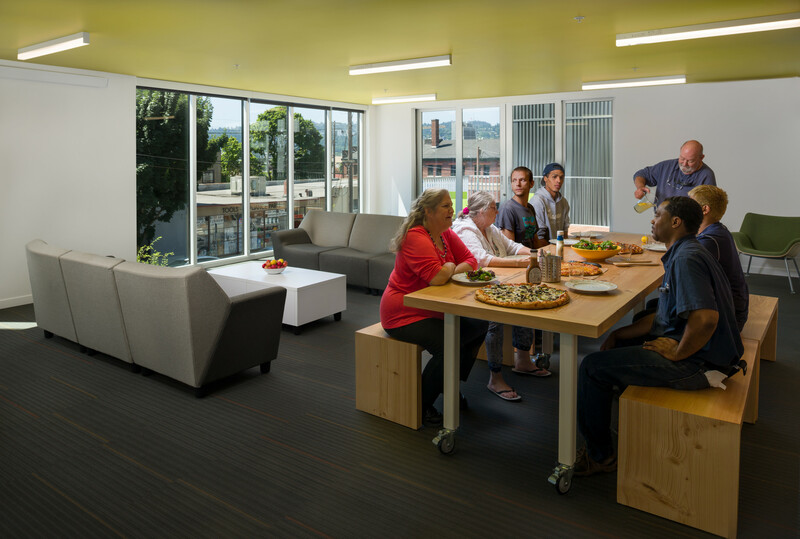 A beautiful large wooden farm table to share a meal, simple and elegant benches to grace community areas, and floating bookshelves in a sharing library all manifest the heritage of St. Francis Park Apartments. This furniture started with a park, not a city park but a community-built park created in 1969 and owned by the adjacent St. Francis Church. Built with aspirations of it being an enduring and active community asset, the park was no longer a thriving and healthy community space and the parish could not continue its maintenance. However, trees were flourishing there – the foliage blocking views of the park’s interior. When the church sold the land to be developed as affordable housing, it was bittersweet. 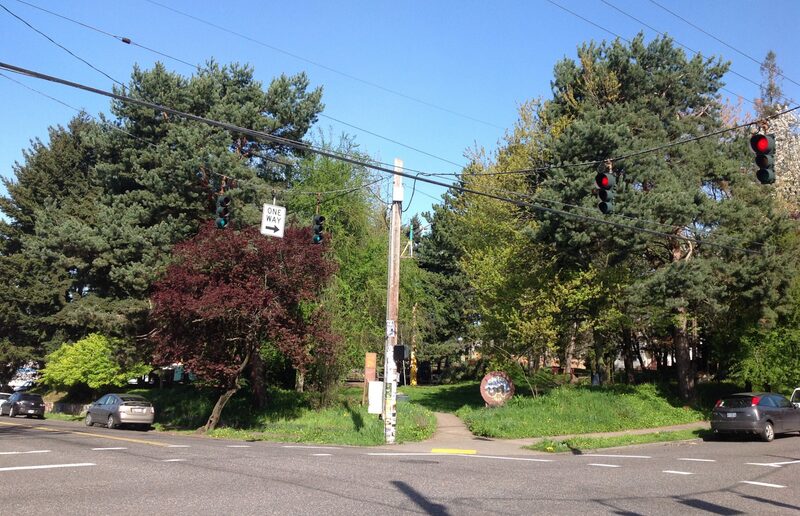 No one feels great about cutting down trees in a city, especially in Portland, a city that prides itself on its sylvan setting. 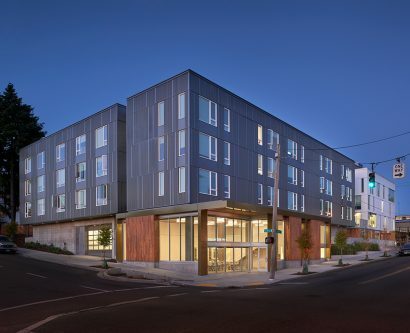 Nevertheless, we all support providing affordable housing in a close in and accessible neighborhood, especially housing to accommodate some of our most vulnerable, the formerly homeless and women coming out of domestic abuse. MWA approaches projects in a community forward way with the idea that affordable housing is deserving of the highest quality of design. The trees represented the history and aspirations for the site and could continue on to serve the new community – not as a memorial but with serviceable use. It is always a plus when we are given a beautiful natural material to work with to enhance the spaces for the residents. Milled by Harrity Lumber, the salvageable park trees yielded 400 board feet of Redwood, 100 board feet of oak and 150 board feet of fir. The owner, Catholic Charities liked the idea of a big farm style table as a centerpiece and a place to help create community among the residents. O’Neill/Walsh Community Builders demonstrated their excellent craftsmanship in building these pieces. ABHT provided minor load calculations to work with the thickness of the wood and the bracing. TABLE – Meant to last for generations, the farm style table is a 3’4”x10’ x 2’6” tall table formed of two monolithic 3’ thick slabs of salvaged fir and redwood with a clear stain supported on a steel frame with casters. The design was an effort by MWA’s Ian Flood, Diana Moosman, and Margaux Wenz. 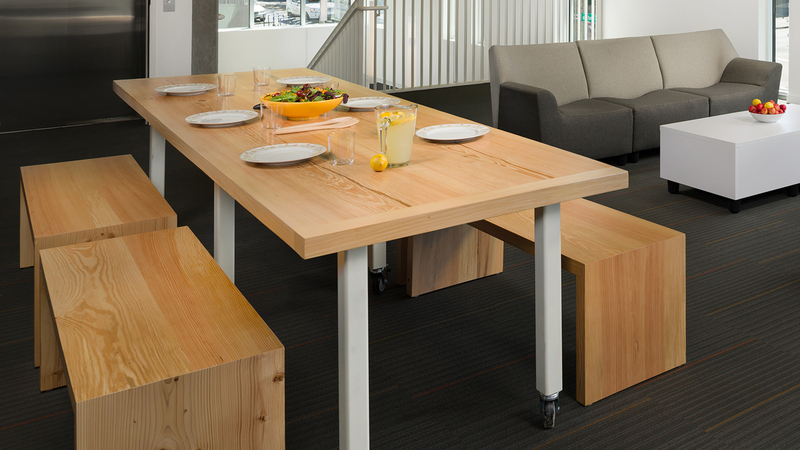 Seating for the table is provided by benches also made of salvaged wood with waterfall edges and rabbet miter joints. BENCHES – There are several salvaged wood benches throughout the new apartment building’s community spaces that provide a simple and beautiful note to these rooms. One that stands out is the feature bench underneath the salvaged wood staircase in the main entry. 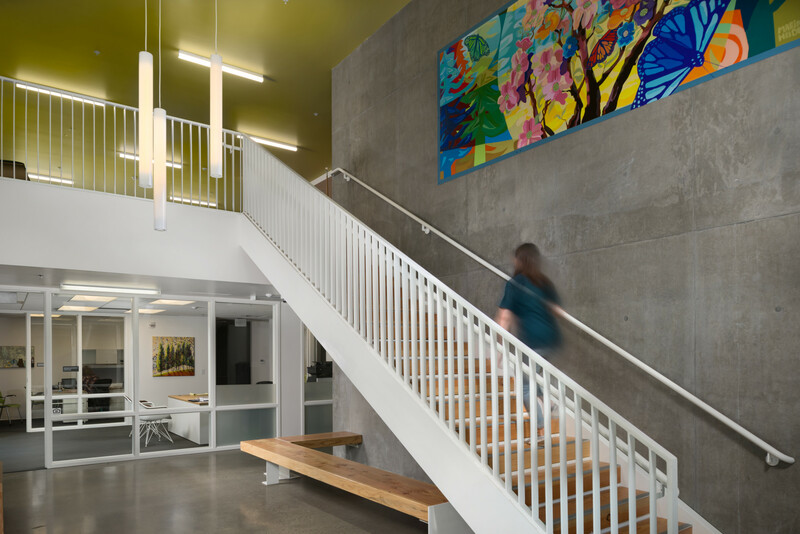 Designed by MWA’s lead designer, Diana Moosman (and refined by Ian Flood, Casey Hagerman, and Nate Carden), this piece was intended to have the heavy wood seem light with the corner appearing to float in the air mimicking the profile of the stairs. 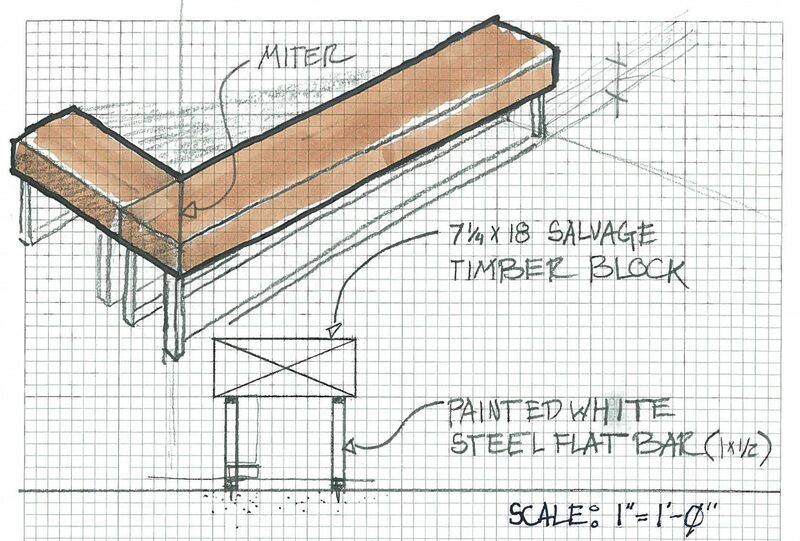 This bench is cantilevered with a steel structure with the wood serving as a cane rail for ADA requirements. Its design elegantly responds to the stairs as a unifying element for the entry, and frames the space near the elevator. FLOATING LIBRARY SHELVES – Designed by MWA Interior Designer, Margaux Wenz. Salvaged wood book boxes float above a small alcove with chairs creating a place for a book sharing library and reading nook for residents.